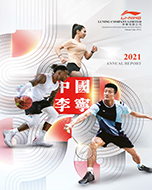 Li Ning Company Limited recognizes its responsibilities in relation to the collection, holding, processing or use of personal data under the Personal Data (Privacy) Ordinance. Personal date will be collected only for lawful and relevant purposes and all practical steps will be taken to ensure that personal data held by Li Ning Company Limited is accurate. You can use this website without providing any personal data. However, you may wish to provide your personal data to Li Ning Company Limited [by completing the forms and submitting questions to Li Ning Company]. to assist in law enforcement purposes and meet other requirements imposed by law. Once we have obtained your personal data, they will be maintained securely in our system. Only authorized staff, who have been properly trained, will be permitted to gain access to such personal data. Li Ning Company will take all practicable steps to ensure security of personal data and to avoid unauthorized or accidental access, erasure or use. Under the Personal Data (Privacy) Ordinance, you have the right to ascertain whether Li Ning Company Limited holds your personal data, to obtain a copy of your data and to correct any data that is inaccurate. You may also request Li Ning Company to inform you of the type of personal data held by it.